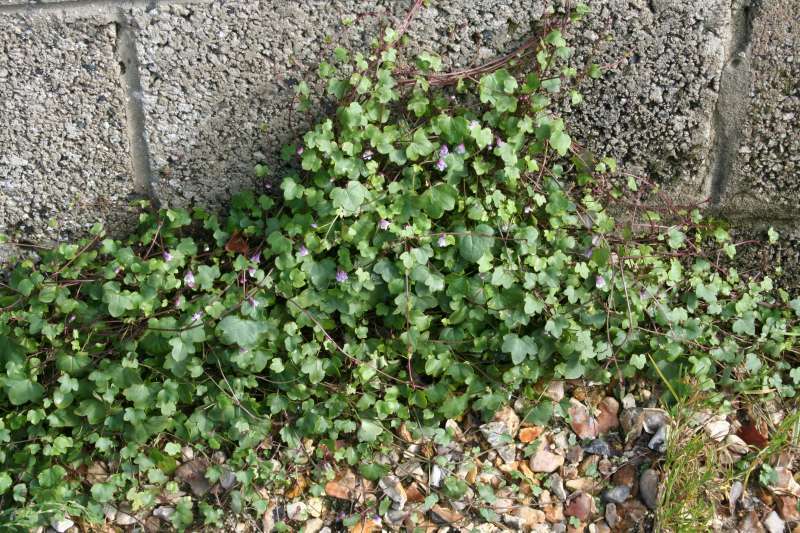 Ivy-leaf toadflax is a pretty plant that, as the latin name (muralis) indicates, grows on walls, paved areas, gravel etc. It has a pretty violet flower, and is worthy of cultivation in any garden with suitable habitat. The seed-pods are interesting , for as they form, the stalk bends backwards towards the plant roots. It is this behaviour which hopefully will allow the next generation to find a suitable chink in the wall in which to grow. The leaves though small are quite fleshy and may be added to salads. The specimen photographed was at the bass of a breeze-block wall of a farm building in Wooton Fitzpaine, Dorset. Photographed August 12th 2008.